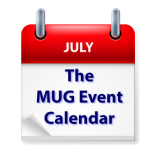 This week’s MUG Event Calendar is highlighted by Jeff Gamet, who will talk about Apple Music at a California group. The new, 2015 version of Adobe Creative Cloud will be the topic of discussion at a Washington D.C. creative pro group, while a Michigan group will look at eradicating adware and malware from your Mac. Other topics on this week’s calendar include Photos, El Capitan, iOS 9, and a picnic. Maine Macintosh Owners & Operators Society – "Where’d My Photos Go?" Los Angeles Creative Pro Users Group – Heather Williams from Atomos who will show off the new Atomos Shogun and more. Plus Jim Tierney from Digital Anarchy who will show us the latest Beauty Box Video. Plus Alicia Reed from JVC who will show us the new and must see GY-LS300CHU Digital Cinema Camera. Plus Filmmaker John Putch shows us how he made a James Bond type title sequence for his latest comedy ROUTE 30 THREE! using off the shelf plug ins and a timeline in Adobe CC Premiere Pro.